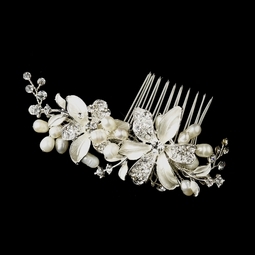 Description: This is a truly wonderful and precious bridal hair comb. Two charming silver plated flowers are encrusted with glittering clear rhinestones and are delicately surrounded by sprays of lustrous ivory freshwater pearls and sprigs of more dazzling clear rhinestones. This piece will be a darling accessory on any classic or vintage inspired bride with an ivory wedding dress.